Have you seen The Walking Dead??? It's like the BEST show on TV and stars the hottest man alive, Norman Reedus. On Sunday, February 12th, the second half of season two starts. I cannot wait!! It has been months since last fall's episode but it feels like forever. I'm still not over what happened, I was completely and utterly shocked!! Now, normally I do not like anything gory, bloody or violent BUT this show is so much more than that. It has this human layer that everyone can relate to. You feel for the characters and want them to live. The show started off in a the state of Georgia that has been over taken by Zombies. The show is based on the comic book series, The Walking Dead. 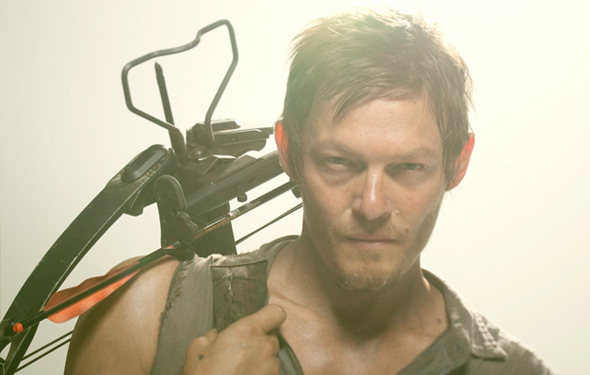 The character that makes the whole show is Daryl Dixon, played by the very talented Norman Reedus. The show wouldn't be as good as it is, if it wasn't for Daryl. In the begining, you hated him because he was a racist redneck who cared for no one. As the season goes on, Daryl changes and you see that he really isn't such a bad guy and all he really needs is some love. Every episode you find yourself surprised by the changes in Daryl. If you haven't checked out The Walking Dead, you are missing out!! It's the type of show that leaves you wanting more and you can't wait to see what is going to happen next. If you do watch it, who is your favorite character?? The Walking Dead is on AMC.